Updated (8/7/2012): Added screenshot at end of post of which includes data broken out by fiscal calendar (starts in July) and link to that file as well. Updated (8/9/2012): Added some information at the bottom of the post in regards to downloading issues and more information available in the comments section. 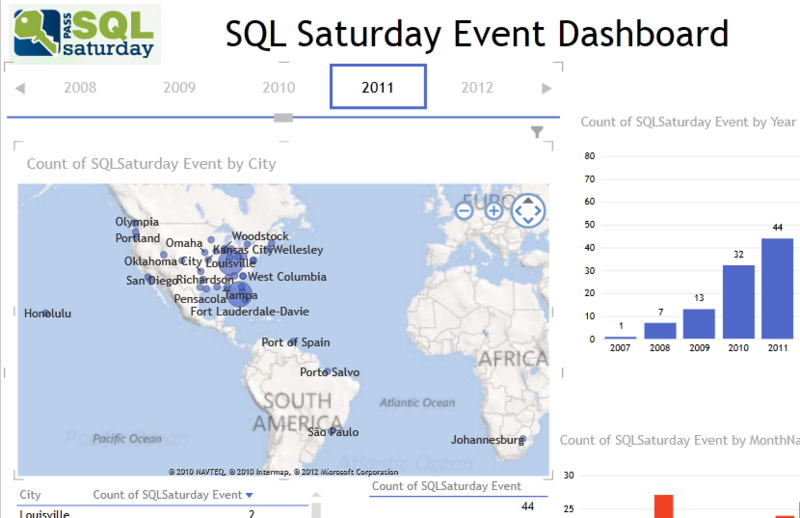 We can see that the SQL Saturday events over the past couple of years have really grown in popularity and after 2010 they went global as well. We can zoom in on the map and get a close up as well. 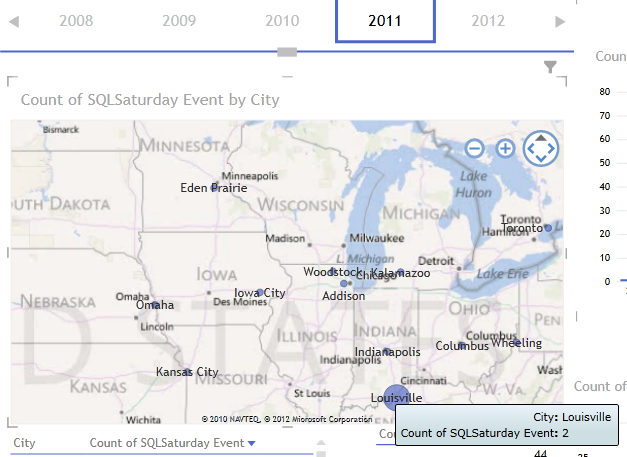 Last year we had the SQL Saturday #99 in Eden Prairie, MN. I even added the ability to drill down from the cities to the zip code level and also some drill down on the column chart for the counts as well. We can even upload this into the Office 365 preview and share this information as well which support PowerPivot and Power View. 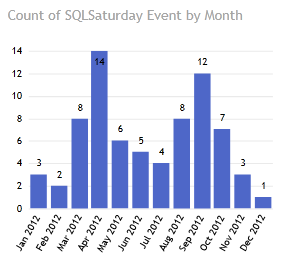 The data that I grabbed for this was from the SQL Saturday events page here (just copy paste and a bit of cleanup). If you are experiencing any issues with the downloads take a look at the comments section of this post. 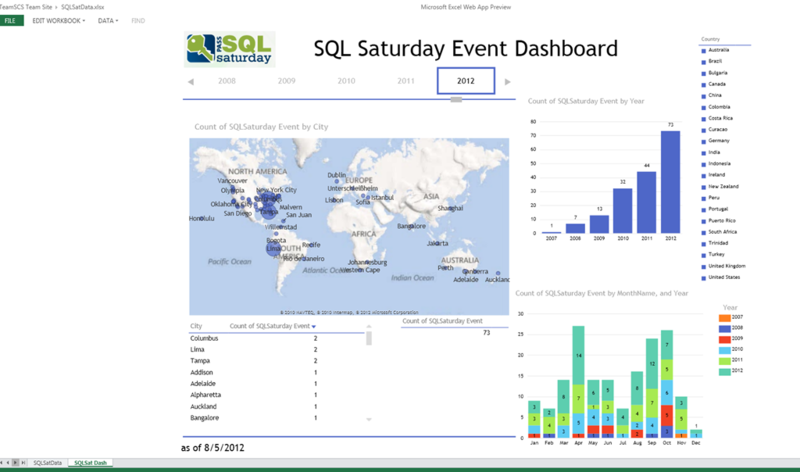 I did some testing and found some issues if you try to directly download the file from the browser and a workaround if the SQLSat Dash does not load for you. You can download the file(s) from my Public|Blog SkyDrive folder. 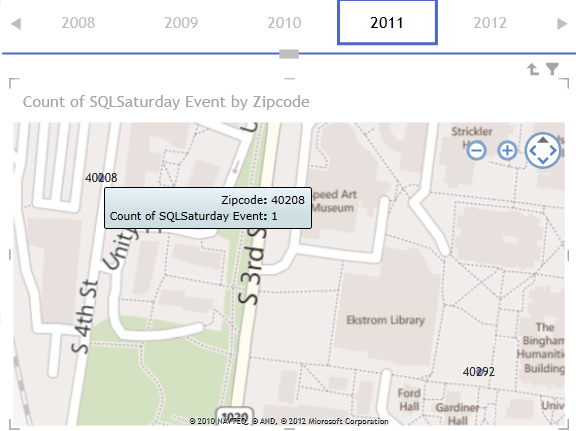 This entry was posted on August 6, 2012 at 5:57 am	and is filed under PowerPivot, Reporting Services. Tagged: excel, excel services, power view, sqlpass. You can follow any responses to this entry through the RSS 2.0 feed. You can leave a response, or trackback from your own site. This is fantastic! I’d be interested in viewing this by PASS’ Fiscal Year (July 1 to June 30). I assume easily doable just by changing/adding some specific dates in? the download link didn’t work. Can you fix? I updated the links, so now it opens up in Office Excel Web App. From there you can download I guess. Not seeing a quick way to provide a direct download link, I was trying, but it must just be temporary. Something weird going on. I downloaded the .xlsx, open in Excel2013, and in the area where the Power View report was there is simply an image that is an illustration of a Power View report (and I know its an image cos when you select it “Picture Tools” appears at the top). 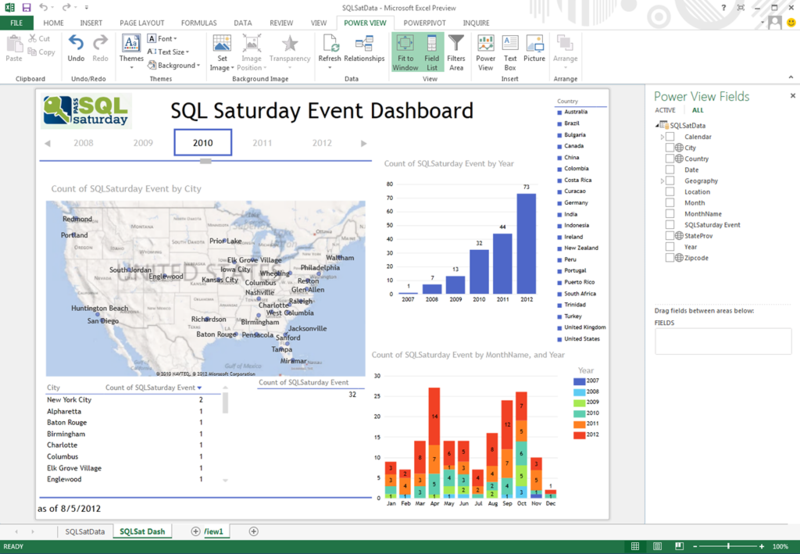 I’m getting more and more exasperated with the whole Power View in Excel story. It should be brain dead simple to view this stuff, and it isn’t! Nope, that didn’t work for me. I downloaded from the folder, disabled/enabled Power View add-in…I’m still seeing the image. Really not impressed at all, even if IS a preview. You make me laugh Jamie:) After you disable it and click ok you have to go back into the add-ins to enable it again. Then once you click on the Power View sheet it should open it up without any issues. Maybe we are running into a localization issue, I programmed it to only work in U.S.:D (j/k). Not sure why it is not working for you. Sorry man. Ya beat me to it getting this out. 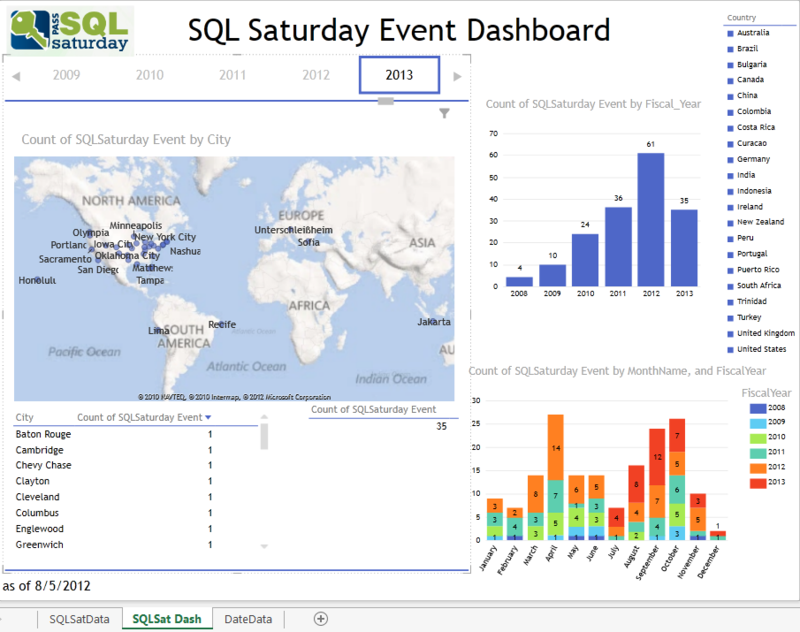 It’s great having the mapping layer and Power View in Excel 2013. Incidentally, your book should be in my hands today or tomorrow. Looking forward to learning some new stuff on Power View. Great to hear. Definitely leave feedback on the book and let us know what you think. Leave a review on Amazon as well:) Thanks and hope you enjoy the book and Power View! I love this demo – wonderful job!